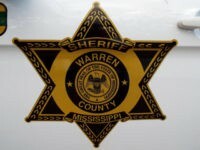 Officers with the Federal Investigative Police killed six cartel operatives during an exchange of gunfire as the officers attempted to serve an arrest warrant in the border state of Sonora. Traficantes relacionados con el Cartel de Sinaloa continúan usando cañones de aire para lanzar paquetes de drogas sobre la cerca que es la linea divisoria entre Sonora y Arizona. Smugglers from the Sinaloa Cartel continue using air-powered cannons to launch drug bundles over the fence that marks the border between Arizona and Sonora. 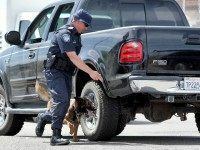 Cartel-Connected Mexican Police Chief Caught Sneaking into U.S.
PHOENIX, Arizona — A Mexican police chief who is believed to be working with drug cartels was arrested after he illegally crossed into Arizona while fleeing from Mexican authorities. 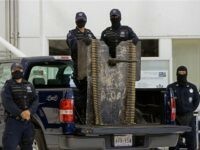 The ongoing struggle between the Sinaloa Cartel faction known as Los Salazares and the Beltran Leyva Cartel led to a new wave of violence as gunmen executed six victims in one day near a beach resort. 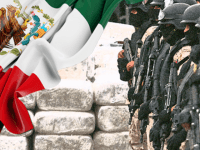 Residents in the border state of Sonora are bracing for another wave of violence as factions of the Sinaloa and Beltran Leyva Cartels continue fighting for control of lucrative drug smuggling territories. 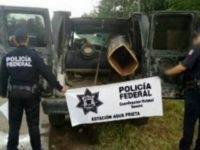 Contrabandistas de cártel mexicano modificaron una camioneta para instalar un gran cañón usado para disparar grandes paquetes de droga sobre el muro en la frontera entre los estados mexicano de Sonora y Arizona. 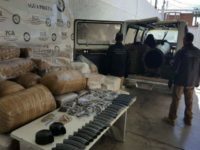 Mexican cartel smugglers converted a van to house a cannon used for shooting large drug bundles over the border fence between the Mexican State of Sonora and Arizona. 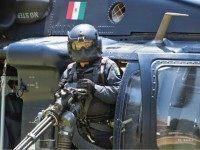 A Mexican drug cartel appears to be ready to go to war once more with the fearsome Sinaloa Cartel. 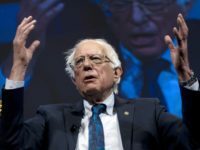 The hostilities began in the most offensive way, the Beltran Leyva Cartel ransacked the home of Consuelo Loera Perez, the mother of Joaquin “El Chapo” Guzman Loera. Before Mexican actress Stephanie Sigman was sharing a bed with Daniel Craig in the upcoming Bond film Spectre, the woman grew up in one of the most volatile regions of Mexico, and her brother says she’s lucky she got out.